The West Kelowna Warriors find themselves fighting for their playoff lives after a 4-0 shutout loss to the Trail Smoke Eaters on Monday night in Game #3 of their best-of-seven Interior Division Quarter Final from Royal LePage Place. The Warriors will have their backs against the wall in Game #4 on Tuesday night in the potential final game of the series as they fell by a 4-0 score on Monday night in Game #3. The Warriors and Smoke Eaters traded chances throughout the majority of the night with Trail being just one bounce ahead of West Kelowna all night long. I know this is going to sound homerish in a 4-0 game but this really could’ve gone either way with Trail getting a couple of bounces that the Warriors could not get. Take, for example, the first (and eventual game winning) goal of the game off the stick of Troy Ring. A harmless shot from the half boards just outside of the right face-off circle found it’s way to the back of the net after going off of a couple of bodies in front of the goal and past the glove side of Nik Amundrud. A very unfortunate break in a game that saw both teams going back-and-forth with chances in the opening 15 minutes of the game. The second bad break in the game for West Kelowna happened just before the second goal of the game with under five minutes remaining in the 2nd period. Jared Marino made a strong rush through the middle of the ice and from just inside the blueline let go of a shot that was kicked out by the left pad of Adam Marcoux with the rebound spurting to the right circle for Marino to chase down and swatted the loose puck through the legs of Marcoux but just past the post with the Smoke Eaters carrying the puck the other way before Andre Ghantous was hooked up by Garrett Ewert to give Trail a power play. Just six seconds into the man advantage, Connor Welsh’s left point shot was redirected in off the left thigh of Tyler Ghirardosi to give Trail a 2-0 lead and another instance of where the bounces just didn’t go the Warriors way on this night. The Warriors played a pretty good game on Monday night, as did the Smoke Eaters, but it was the visiting team that came away with the hometown bounces. The officiating took a wonderful turn on Monday as both Bronson Tazalaar and Nick Panter did a great job of allowing the game to play out and putting the whistles away but it wasn’t the special teams that the Warriors were short handed in. West Kelowna lost two of their better defensemen in the 1st period on Monday night as Jake Harrison took an awkward hit into the end boards and was slow to get back up to his feet inside the Smoke Eaters zone. Harrison had to be helped off the ice and did make a return on the Warriors bench at the beginning of the 2nd period but didn’t make it out on the ice for the remainder of the game and will be looked at on Tuesday in hopes of playing Game #4 and not much is going to keep “Harry” out of a game as he is one of the toughest players I have seen. The next bad piece of news for the Warriors was the absence of Tyler Jutting, who left in the 1st period after a few shifts and then was out of the game and did not make a return, putting the Warriors in a tough bind with 4 regular defensemen. That hurt the Warriors in a big way having to play their defense in such a big capacity but, in saying that, the D that did remain in the game for the Warriors were real good. Cody Paivarinta had his best night as a Warrior as he was strong on the puck and tough to play against inside of his own zone. Wyatt Head also had a strong night with some elevated minutes along with Garrett Ewert eating up some minutes with his play. Even Jordan Todd got in on the act as the forward shifted to defense for some shifts throughout the final 40 minutes of the game and held his own well. I’m not sure what the status of either Jutting or Harrison will be for Game #3 but the Warriors, who are already with Stephen Kleysen, will need to use each and every little bit of strength they have to try and get the series back to Trail. My takeaways from the Warriors 4-0 shutout loss to the Smoke Eaters in Game #3 of their Interior Division Quarter Final is that West Kelowna will have to dig deep in order to get back in this series but credit the Smoke Eaters as they have been the best team in three games of the series. I thought the Warriors game was pretty good on Monday night but will need to look at shooting more, especially on the man advantage. With Harrison and Jutting leaving early (along with Ryan Steele being suspended for three games, it was tough to get anything going offensively. The shots just weren’t there and with some of the rebounds that laid loose around the crease of Marcoux, there were definitely opportunities to be had. To add to that point about not having enough shots, they’re best chance came of the stick of captain and birthday boy Jared Marino, who had a pretty good night himself. The Warriors will need to dig deep on Tuesday if they plan to have their playoffs stay alive. The Warriors did a lot of good things on Monday night and will now be playing win-or-die kind of hockey. The Warriors will have their backs against the wall as they host the Smoke Eaters in Game #4 of their best-of-seven Interior Division Quarter Final looking to keep their season alive down three games to none in the series. Tickets are available online at wkw.goticketpro.com, at the Warriors office, by calling (250) 769-7051 or at the box office ahead of the opening face-off. The West Kelowna Warriors couldn’t find a way to earn a win on the road against the Trail Smoke Eaters in the first two games of their Interior Division Quarter Final and trail the series 2-0. The first two games of this series have seen more special teams play than even strength opportunities, or so it seems anyway. Game #1 on Friday night saw the Warriors go 4/8 on the power play and a combined 14 power plays between both West Kelowna and Trail. Game #2 saw the same in the way of 14 combined power plays between the two teams but the difference was Trail received 11 of those 14 man advantages. ELEVEN. What officials Dave McMahon and Dustin Minty did to Saturday night’s game was incredibly tough to watch and I can only imagine how difficult it would’ve been to try and play through. The first two games of this series are a bit tough to describe because of the pure inconsistency of how the games are being called and it’s something that I very much hope changes when the series shifts to West Kelowna. These two teams are such good skating teams and could make for a very good series but they haven’t really had a chance to do that with the men in stripes getting in the way. Each team’s power play has converted five times in the first two games of this series and played a big factor in Saturday’s game with Trail scored 4 of their 7 goals on the man advantage. Each team will look to try and shore things up from a discipline standard when the series comes to West Kelowna but so far, it has been a special teams battle through the opening 125 minutes of action between the Warriors and Smoke Eaters. 28 power plays through two games is something that no one wants to see and I sincerely hope that gets rectified over the course of this series, beginning in Game #3. Yes, the Warriors are down in the series by a 2-0 tally but I certainly would not count this team out of coming back and earning a couple of wins on home ice in Games #3 and #4. The Warriors opened the series with tremendous jump on Friday night with a three-goal 1st period to get out to a 3-1 lead before the Smoke Eaters came back with four goals in the first five minutes of the 2nd period to get a 5-3 lead. The Warriors came back with a pair of power play goals to tie the game at 5-5 before Kale Howarth ended the game with his overtime winner just over five minutes into the extra frame. Game #1 wrapped up in a nutshell was a crazy game with both teams blowing two-goal leads and one that was up for grabs by either squad until the Howarth OT marker. The shots in the game were a bit deceiving on how the game actually was as I thought both teams had chances to win the game but the same could not be said for Game #2 of the series. Again, the Warriors came out with some strong jump and Jared Marino had a chance to open the scoring on a backdoor play at the blocker side but couldn’t get it past Adam Marcoux. The 1st period was a pretty even one with Trail leading in shots by a 12-11 margin but the Smoke Eaters had the all-important advantage on the scoreboard at 3-0 and were very opportunistic on their chances. After the opening 20, the penalties started to come in waves and the Smoke Eaters took over the game en route to a 7-2 victory and a 2-0 series lead. As the series makes it’s way to West Kelowna, this 7-2 game should add some more fuel to the fire for the Warriors to try and forget about how Game #2 went and come out strong on Monday night to try and serve Trail their first loss of the series. My takeaways from the Warriors first two games of the Interior Division Quarter Final against the Trail Smoke Eaters would be that the Warriors have started each of the games very well but need that start to translate into a full 60-minute effort. There have been some really good things that the Warriors have done through the first two games of this series including a power play that has been sizzling hot and a fore-check that I thought did an excellent job in the first 30 minutes of Game #2 to force Trail into some tough situations in their defensive zone in trying to breakout. As for individual players, it’s hard not to like how Ryan Steele plays each night. He has been outstanding sine he pulled a Warriors jersey over his shoulders and is consistently one of the Warriors best players night in and night out. Chase Dubois had a pretty strong two games to open the series while RJ Murphy just does things the right way each and every time he hits the ice, even when it doesn’t show up on the scoresheet. Trail’s big guns of Kale Howarth, Ross Armour and Levi Glasman have established themselves in the series and are so tough to contain on any given night. You know they will get their chances each night but it’s how you can contain how many looks they get and the Warriors have struggled with containing them through the two games in this series. I’ve really liked how Braeden Tuck plays as a skilled and hardworking forward who has had the Warriors number all season long while Jeremy Lucchini has had a strong two games on the back end for the Smoke Eaters. The Warriors trail the best-of-seven series by a two games to none count but, as is the case with the playoffs, a little momentum from a large crowd at RLP on Monday night and maybe even a Game #3 victory and who knows how that can affect the remainder of this series, which is still well within reach for West Kelowna. The series shifts to West Kelowna for Game #3 on Monday, March 5th at 7:00 PM as the Warriors look for their first win of the series against the Smoke Eaters. Children 16 and under get into the game with free admission with tickets available for purchase online at wkw.goticketpro.com, at the Warriors office, by calling (250) 769-7051 or at the box office ahead of the opening face-off. If you can’t make it to RLP (or are a Smoke Eaters fan that happened to stumble upon this), I’ll have the call on the Warriors Internet Network and HockeyTV.com at 6:45 PM with the pre-game show. 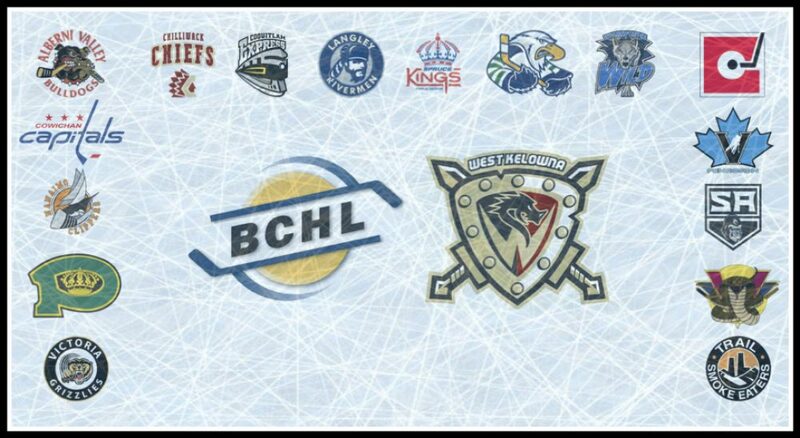 The West Kelowna Warriors open up the first round of the BC Hockey League Playoffs as they take on the Trail Smoke Eaters beginning at Cominco Arena on Friday, March 2nd. Since the playoffs go so quickly (and I’d like to get some sleep at some point), I won’t be doing pre game blogs but just this one big series preview. Post game blogs will continue (as normal) as well as posting highlights of each of the games. The Warriors and Smoke Eaters have met three times in the playoffs in their history with West Kelowna winning all three of those series. They actually came in back-to-back-to-back years from 2009 to 2011. The first was a best-of-five series in which the Warriors swept the Smokies in three games while 2010 saw the Warriors earn a series win in five games. West Kelowna capped off their trifecta of playoff series victories with a seven-game series win against the Smokies with Game #7 being a 4-0 shutout victory. Although the short playoff history between these two teams, things will head up rather quickly when both sides hit the ice for Game #1 on Friday. He’s been an absolute force for the Warriors since being acquired from the Alberni Valley Bulldogs and has the makings to be a great playoff asset for the Warriors. Steele has collected 25 points in his 18 games in a Warriors sweater and finished the regular season on a 13-game point streak. In that baker’s dozen stretch, the Sacred Heart University commit has collected 11 goals and 12 assists for 23 points in that time and, along with linemates Parm Dhaliwal and Chase Dubois, have been tough to handle in the offensive zone. Steele didn’t get chance to get into any playoff games with the Bulldogs last season with Alberni missing out on the postseason and you know the 20-year-old forward will be jacked up to keep his season going as long as possible. He’s been hard on the puck, strong in front of the goal and has speed that can creep up on any defender. He will be a player to watch throughout the entire series to see if he can give the Warriors some jump and energy especially on the road. Dhaliwal has been a strong point producer since returning from his injury that took place in December and hasn’t looked back. The second year forward has been in this spot before as he was on last year’s Warriors squad that suffered a four-game defeat at the hands of the Merritt Centennials and is something this year’s team would like to correct. Dhaliwal scored a career high 17 goals and 41 points in 43 games this regular season and has scored four goals in his last four games. He’s been a reliably consistent player for the Warriors in the last two months and could play a big part not just offensively but on the defensive side as well. Dhaliwal is one of the better centreman for the Warriors and could see himself lining up against some of Trail’s better centres. The Surrey, BC native has been a big part of the Warriors success over course of the regular season and will be leaned upon heavily in the postseason. It’s been a big week for the Warriors most veteran playoff performer as he recently committed to the University of Michigan Wolverines and will play a big part throughout the course of this opening round series. The Warriors rear guard has played in 39 games during his playoff career and that experience will prove to be vital as this postseason rolls along. Harrison is a spark plug on the Warriors bac end and throughout their entire lineup and, although not the biggest in stature, certainly plays with plenty of heart, hence his picking for the Warriors Heart and Soul and Fan Favourite awards two weeks ago. He will play against Trail’s top guns and in many key situations in the series and could be one of the difference makers in the series. He is one of four players to be drafted in the National Hockey League and is among some of the top players in the BC Hockey League. Howarth is an elite talent with tremendous size and skill and only takes a few strides to get going through the neutral zone. Howarth finished second on the team in scoring behind Ross Armour but, in my opinion, is the biggest game breaker on the Smokies roster. The most impressive thing about Howarth’s stats is those 24 goals and 61 points came in just 44 games this season. At 6’5″, 207-pounds, he will be a tough force for the Warriors to try and contain and could play a big part in deciding this series from a Trail perspective. In the playoffs, often times it’s not the highest scorers that find a way to come up with the biggest plays of the game and, for me, Braeden Tuck could be that X Factor. Tuck has been a pain in the side of the Warriors all season long with 5 of his 19 goals on the season coming against West Kelowna. The Calgary, Alberta native is second on the team in power play goals with 7 and leads the Smokies with 3 shorthanded markers on the season as he plays in all situations, which makes him an interesting candidate for being a player that could strike at any time. Don’t get me wrong, Ross Armour will play a big role in this series at some point for the Smoke Eaters but Tuck has all the traits to be a player to keep an eye on for however long these two teams wish to play. It’s the most unfair position in hockey but Adam Marcoux has done an outstanding job for the Smoke Eaters since coming over from the Cowichan Valley Capitals and when it hits the playoffs, it’s all about what you have in between the pipes. Goaltending will be the number one story in this series, in my opinion, and Marcoux has dazzled since his arrival in Trail to the tune of a 2.78 GAA and a .917 SV% since December 9th, his first start as a Smokie which coincidentally came against the Warriors. Marcoux has welcomed the change of scenery to Trail but has only gotten into 7 minutes of a playoff game in his career. Playoff hockey is a completely different animal and Marcoux will be front and centre for each and every game of the series. My take on this series is that this will be entertaining and most likely last more than four or even five games. These two teams match up so evenly with as both possess very strong forward cores and defense. The top line of Howarth, Armour and Levi Glasman will be a tough test for the Warriors but West Kelowna has so much depth up and down their lineup that it’s going to be tough for Trail to match up against that. Defensively, I’d give an edge to the Warriors although the loss of Stephen Kleysen was a big one on the back end with Trail’s Troy Ring being a big player on the blue line for the Smoke Eaters and will see a lot of the ice. Cody Paivarinta is expected to return to the lineup for the Warriors and with the likes of Harrison and Michael Ryan patrolling the back end, it should make for an intriguing battle between the top line of the Smoke Eaters against some of the top defensemen of the Warriors. In goal, the battle of the series may very well come between Adam Marcoux and Nik Amundrud. Marcoux has been great since being in Trail while Amundrud has had an up and down season statically but had a great game in his final regular season contest in Merritt last Friday and may have been a springboard to get him on a roll. Add in that Amundrud has played some strong games in Trail this season and that makes for a healthy battle of veteran puck stoppers. The buildings are going to be loud as Trail pumped 2800 fans into Cominco Arena for their final regular season game against Salmon Arm last Friday while the Warriors have gotten their best two crowds of the season in last two home games and sets up what will be a great atmosphere when the series shifts back to West Kelowna in Games #3 and 4. This series is going to be a lot of fun and I hope you will able to join us on the fun, heart pounding, intense, nerve wracking and exciting ride that is the playoffs. The Warriors and Smoke Eaters get things going on Friday, March 2nd at Cominco Arena for Game #1 of the Interior Division Quarter-Finals for a 7:00 PM face-off. We’ll be on the air at 6:45 PM on the Warriors Internet Network and HockeyTV.com with the pre-game as I’ll have the call for you from the Kootenay’s. The West Kelowna Warriors close out their 2017/18 regular season schedule with a trip to the Shuswap and a date with the Salmon Arm Silverbacks at the Shaw Centre on Saturday night. Although this game has no meaning in regards of the standings, there is still plenty of pride on the line and the chance to finish off the regular season on a strong note as well as tie the season series with the Silverbacks. The Warriors did their part last night with a gutty 2-1 overtime victory in Merritt against the Centennials off of a strong game in between the pipes from Nik Amundrud, who made 40 saves for his 17th victory of the season. Jake Harrison scored in regulation with a shot from the left point that got through Austin Roden on the glove side with Willie Reim providing an excellent screen in front of the goal. Merritt tied the game on an own goal by the Warriors with that being the only scoring in regulation, happening about 4 minutes apart from each other before the game was sent to overtime and did not take long to finish. Ryan Steele raced down the middle of the ice and sent a pass to the right wing for Parm Dhaliwal as he shot from the right half boards and beat Roden on the glove side to secure the Warriors of the 5th place seed in the Interior Division. It was a big win for the Warriors and they helped themselves out to not make tonight’s game “worth all the marbles” but will still need to come out and keep things competitive as West Kelowna looks to try and finish the season on a high note and pick up points in their fourth straight game. Cole Demers will get the start in goal after Amundrud’s big night last night and it’s a big game for Demers, who has not won in his last six outings as he looks to break through that and the Warriors look to head into the playoffs playing strong hockey. This is a key that has a couple of meanings and the first would be to keep the turnovers and managing the game to keep good habits going. You don’t want to have bad habits creep into your game, especially in the final game of the season that does not have any meaning in the standings department of things. Playing a simple game and not complicating things will help the Warriors in an effort to try and finish off the regular season on a winning note. The other key to keeping things clean will be from a discipline side. Judging off of boxscores and the fact that Salmon Arm has had two of their players suspended in their last three games, the Silverbacks aren’t afraid to play reckless and the Warriors will have to stray away from engaging in that kind of play. The last thing anyone wants in this kind of a game is to have a player suspended or even worse, have someone get hurt. The ‘Backs did get their third blow to the head penalty last night in their last three games and will be something the Warriors will have to be weary of. Salmon Arm’s penalty kill has not helped them out much in their undisciplined ways as they are 8/18 (44%) over their last three games and the Warriors power play, which has goals in three straight games, could make the Silverbacks pay for penalty trouble if they come into any tonight. The Warriors penalty kill was excellent last night, going 6/6 on the night and will look to head into the postseason playing it’s best. The Salmon Arm Silverbacks come into Saturday night looking to try and break out of their recent funk that has seen them drop their last three games in this ridiculously crazy stretch of playing five games in four and a half days. The ‘Backs have been outscored by a 22-7 margin over those three games and have not allowed less than six goals in their last three contests but have always had a way at being able to stuff the Warriors, defeating them in three of the five games in their season series thus far including a pair of wins at the Shaw Centre. Rhett Kingston has been very strong against the Warriors with 5 points in 5 games against them this season while Hudson Schandor has also found success with a pair of goals and 4 points against West Kelowna this season. Tanner Campbell, Nick Unruh and Trevor Adams will be players to watch for offensively as well as Justin Wilson as the Silverbacks have some dangerous weapons up front to work with. On the blueline, Akito Hirose is always worth watching as he’s a quick mover of the puck and can quarterback the power play while the Warriors get their first look at Joe Leahy in a Silverbacks jersey as the former Penticton Vee has yet to dress for Salmon Arm in a game against West Kelowna and is a very good stay-at-home defenseman. Kyle Dumba got the start last night in Trail as well as on Wednesday against Penticton and came into action on Thursday against the Centennials so I’d imagine the Warriors will see Reid Cooper in net for the Silverbacks tonight. Cooper has yet to play the Warriors as a member of the Silverbacks but did make 41 saves in an overtime with the Coquitlam Express in early October against the Warriors. The Warriors and Silverbacks drop the puck on the final game of the regular season at 7:00 PM with the pre-game show getting underway at 6:45 PM on the Warriors Internet Network and HockeyTV.com with myself and special guest colour commentator, Warriors defenseman Stephen Kleysen. The West Kelowna Warriors secured the 5th place seed in the Interior Division with a 2-1 overtime victory against the Merritt Centennials on Friday night at the Nicola Valley Memorial Arena. In a game that, from box score watching, might have lacked the pizzazz that the Warriors have been playing with as of late, it was refreshing to see this team bare down defensively and come out with just one goal against in a 5th-place-clinching 2-1 overtime victory against the Merritt Centennials on Friday. Even though Merritt collected 41 shots on the night, and a heck of a performance from Nik Amundrud, I thought the Warriors did a good job at silencing some of the top guns for the Centennials. May I remind you, this is a Merritt team that came into the game flying, having collected a point in each of their last six games and scored 13 goals over their last two games coming into tonight and the Warriors shut them down and allowed just one goal against. A great effort by the boys in white to come together for a big win and securing the 5th place seed in the Interior Division and now know they will play the Trail Smoke Eaters in the opening round of the BCHL playoffs. It was a big win and two points for the Warriors, displayed after regulation when Amundrud looked to the rafters with a double fist pump, knowing the Warriors had clinched the 5th seed. Amundrud was outstanding in the game with 40 saves and held the Warriors in game when Merritt pressed, especially on the power play late in the game and on any one of their man advantages throughout the game. He was quick to loose pucks around his goal and was like a vacuum when it came to rebounds as there wasn’t much in the way of secondary chances for the Centennials in and around the goal. A great effort form the 5-man defense core (who actually didn’t get scored on tonight as the Warriors committed an own goal error) and a strong effort in goal helped the Warriors to the overtime victory. It was one of my keys before the hockey game tonight and it turned out to play a big part in the game with the Warriors being able to stuff a red hot Merritt power play entering the night. The Warriors were able to not allow Merritt’s top guns such as Zach Risteau and Henry Cleghorn go to work on the power play and did a good job at collapsing inside of their defensive zone and not allowing many high quality scoring chances to get through to Amundrud. Jake Harrison had a big night, even without his goal, as he might have been the best Warriors player outside of the blue paint. I thought Harrison did a great job of getting pucks cleanly out of his own zone and was aggressive in the corners in puck battles, especially when down one player in shorthanded situations. Tyler Jutting also had a good night for West Kelowna on the back end, playing hard minutes and not being afraid to play physical in puck battles and use his strong frame to his advantage. As the saying goes, your best penalty killer has to be your goaltender and Amundrud was that for the Warriors tonight, especially in the final moments of the game where Merritt was pouring on the pressure in search of the go ahead goal. Amundrud and the Warriors fended off that late flurry before Parm Dhaliwal ended the game in overtime just 30 seconds into the extra frame to earn the extra point. The Warriors won the special teams battle with Harrison’s power play goal and the penalty kill stood tall in a season series finale that saw West Kelowna come away with the two points. My takeaways from the Warriors 2-1 overtime victory against the Merritt Centennials on Friday night at the NVMA is that the Warriors got great goaltending, strong defending and were able to guard off enough of Merritt’s attack to earn a big win and a clinch of the 5th place spot in the Interior Division. The penalty kill came up in a big way while opportune scoring was a key as well to help the Warriors to their 28th win of the season. Ryan Steele added to his ever growing point streak as it is up to 12 games now with his assist on the final goal of the game while his linemate, Parm Dhaliwal, was excellent as well for the Warriors tonight. Give the Centennials credit, I think they had the more chances in the game but couldn’t get anything past Amundrud with the one that beat him being off his own defenseman’s stick. One thought from the game: with the Centennials going to the power play with two and a half minutes remaining in the game, I’m surprised head coach Joe Martin did not pull his goalie for a chance to win in regulation. The whole building knew the Warriors just needed one point for the 5th place spot and the Cents were looking for a regulation win to force that battle onto the season’s final day but I’m a little curious as to why Joe did not get an extra attacker out on the ice to see if he could get the go ahead goal. At any rate, a solid win for the Warriors on Friday night and makes for a game of pride Saturday in Salmon Arm. The Warriors make the trek to the Shuswap for their final game of the regular season as they take on the Salmon Arm Silverbacks for the sixth and final time this season. Puck drop is slated at 7:00 PM with the pre-game show getting underway at 6:45 PM on the Warriors Internet Network and HockeyTV.com with the Voice of the Warriors, Trevor Miller. The West Kelowna Warriors take in the final weekend of the regular season with a trip to the Nicola Valley to face-off against the Merritt Centennials at the Nicola Valley Memorial Arena on Friday night. The Warriors will play in their most meaningful game of the regular season when they make their way to the Merritt to take on the Cents at the comfy confines of the Nicola Valley Memorial Arena. With the playoffs just around the corner, literally next week, the Warriors will solidify who they will play in the opening round of the Fred Page Cup playoffs and could actually do so tonight. If the Warriors can collect a single point (whether a win, overtime win, overtime loss or tie) they would have a first round date with the Trail Smoke Eaters and finish 5th in the Interior Division. If the Warriors cannot get a point in the game tonight, a 5th place finish comes down to the wire tomorrow night in Salmon Arm. The much easier path would be to just win tonight and the Warriors will have to do so in a building where they have struggled to find success over the last two seasons. Since a 4-1 victory on January 4th, 2017, the Warriors have lost six straight games (including two playoff games) at the NVMA, being outscored 36-15 in that six game span. Seems like a perfect time to bust a slump, no? The Warriors obviously want to finish as high as they possibly can in the standings and a victory tonight would make tomorrow night against the Silverbacks much more easy to go through than stressful. The Warriors got a very strong performance through 40 minutes in their game on Wednesday against the Wenatchee Wild but struggled in the first 15 minutes of the 3rd period before bouncing back with two goals in the span of 35 seconds to tie before falling in overtime. If the Warriors can get the same kind of effort from the first 40 minutes throughout the entire game tonight, West Kelowna will see a 5th place finish with Merritt nipping at their heels, just 3 points back of the Warriors entering the night. 2) SPECIAL TEAMS IS ALWAYS A KEY, ISN’T IT? I know it’s late in the season and you’re thinking I’m lazy for using special teams as a key for the last three blogs but, each of those games have seen special teams play a huge factor in the final of the game and I imagine that tonight will be no different. The Warriors did some good things while on the power play in Wednesday night’s game, scoring twice on the man advantage but surrendered three goals while on the penalty kill, including a shorthanded goal in a game that was predominantly a special teams matchup. With the way the Warriors penalty kill has been trending (now sitting 16th in the BCHL at 76.7%), they will need to stay discipline and try and take as few penalties as possible with the PK’s struggles. Something else to factor into that is the Cents power play and, well, it’s been crazy good over their six-game unbeaten streak. Merritt has found the back of the net on the power play in each of those six contests and is 12/27 on the man advantage in that span, including four power play goals in their game on Thursday against the Silverbacks. The Centennials began the season as one of the struggling teams on the power play but have resurged all the way to being ranked 4th in the BCHL at 21.2% on the season. It will be a battle of a pair of power plays that have been finding the back of the net as of late and penalty kills that will need to step up and come to play. Special teams, especially in a building like the NVMA, could be the deciding factor in the biggest game of the season for both teams. The Merritt Centennials are one of the hottest teams in the BCHL coming into action on Friday night as they are unbeaten in each of their last six games and have been on a tear over their four-game homestand which concludes tonight against the Warriors. The Cents have outscored their opposition 22-10 over their last six games and have been led in scoring on the season by veteran forward Henry Cleghorn, who has 20 goals and 48 points on the year. The scoring for the Centennials is very much by committee as Nick Wicks (46 points), Zach Zorn (42 points) and Zach Court (41 points) are all near the top of the Cents scoring charts. Forward Zach Risteau has been excellent in his return to the Centennials with 20 points in 19 games including two goals and four points in the last meeting between the Warriors and Centennials. Defensively, the Centennials have captain Tyrell Buckley, who recently committed to the Michigan Tech University, as the man who patrols the blue line at a rate of about 35 minutes per night but may not be playing tonight after taking a hit to the head from Salmon Arm’s Logan Mostat but we will wait to see on that. Jackson Munro has had a solid rookie season with the Centennials while Michael Van Unen, along with Buckley, is the most experience that Merritt has on the back end. In goal, both Jacob Berger and Austin Rodin are having incredible seasons with Rodin getting most of the games over the course of February and owns a .940 SV% in 21 games with the Centennials since being acquired from the Nanaimo Clippers by the Cents. It’s a toss up as to who gets the nod in goal but with Rodin making 25 saves on 26 shots last night for the win, I think Jacob Berger will be the guy to get the net against the Warriors tonight. Berger has played three games against the Warriors this season with a .911 SV% and has played the Warriors very well in his career at the Nicola Valley Memorial Arena, posting a 5-1 record along with a 2.33 GAA and a .933 SV% in those games against the Warriors on home ice (including playoffs). The Warriors will have their hands full and what should be a great game between two teams that will leave it all on the ice for a shot at 5th place in the division. The West Kelowna Warriors had the lead, lost the lead, tied the game but eventually fell by a 7-6 score in overtime to the Wenatchee Wild on Wednesday night at Royal LePage Place. It’s a game that featured just about everything and I’m still trying to wrap my head around it. The Warriors had outplayed the Wild through two periods and held a 4-2 lead before the oddest 3rd period of the season with the Wild coming from behind, scoring four times before the Warriors came back and scored twice in 35 seconds to tie the game with Matt Dorsey ended the game 3:49 into the extra frame and finish off what was a (wait for it) wild affair. Heading into the 3rd period with a 4-2 lead, the Warriors have been one of the most airtight teams when leading after 40 minutes with a 22-0-0-0 record in that category before Wenatchee scored four goals in the opening 12 minutes of the period. Only Penticton and Nanaimo have been better when holding a lead this season after 40 but the Wild were able to break through and tie the game before eventually taking the lead and then adding one more goal from the captain AJ Vanderbeck to get a 6-4 lead. You’ve got to give this Warriors team credit as they do not quit, no matter what the situation is and were able to write their own comeback story late in the 3rd period with under two minutes remaining. Parm Dhaliwal jammed in a loose puck at the front of the goal on a rebound before Michael Ryan slid the puck along the ice through the legs of Wenatchee goaltender Seth Eisele to tie the game with goals at 18:15 and 18:40, coming just 35 seconds apart and getting the game into overtime. The Warriors did have a power play chance in the extra frame with the best opportunity coming off of a pair of RJ Murphy shots, coming down the left wing to drive to the net with Eisele making the stop before Jared Marino provided a solid screen in front of Eisele with Murphy’s slot shot being blocked before getting to the goal. Matt Dorsey would end the game on a terrific pass from the left point by Zac Galambos down low to Dorsey in the slot as he went to his forehand and in to end the game in the favour of the Wild and cap off a truly Wild night of hockey. I mentioned it in my “3 Keys” blog pre-game and it turned out to be one of, if not, the biggest factor in the game and might have been the biggest reason the Wild were able to come back in this one. Taking all the special teams out of the game, the Warriors would have come out on top by a 4-2 score but unfortunately, hockey just doesn’t work that way. I thought the Warriors were certainly the better team 5-on-5 but the Wild flexed their muscle on the power play along with a big Lucas Sowder shorthanded goal to tie the game at 4-4 at the 4:44 mark of the 3rd period. The Wild can certainly zip the puck around on the man advantage and did a very good job of that tonight with three power play markers including that shorthanded goal and have now vaulted up to the top spot in the BCHL in power play percentage at 22.8%. Cooper Zech was a big part of the Wenatchee power play with two of his three assists on the night coming on the power play as well as both of Sam Morton’s goal being PPG’s. The Warriors were no slouches on their power play as well as Dhaliwal deflected in a perfect pass from Chase Dubois while the Warriors captain Marino found the back of the net from the slot but it was the Wild who were the better special teams team on this night and earned the victory because of it. 5-on-5 these two teams were flying and making plays with lots of speed and skilled players from both sides but the Wild were the ones to get the better of the Warriors in the special teams department and that was the difference in the game, or at least one of the biggest differences. My takeaways from the Warriors 7-6 loss in overtime to the Wenatchee Wild on Wednesday night at RLP was that the Warriors played a very solid 40 minutes, a start of the 3rd period to forget before tying the game late but then falling in overtime, just your average Wednesday night of hockey. Honestly, this was a pretty fun game to call with both teams so skilled and having the ability to make plays. Ryan Steele had himself a night as he scored twice and added three assists for a five-point night and now sits just five points off of his total from the Alberni Valley Bulldogs in 22 fewer games. His linemates, Parm Dhaliwal and Chase Dubois, have been outstanding as well as they have turned into the Warriors top line with Dhaliwal earning two goals on the night and Dubois collecting four assists. I also liked the look of a line that had plenty of success early in the season as Jared Marino-Cavin Tilsley-Bennett Norlin came together for a strong night with Norlin earning a couple of chances to score in behind the Wenatchee defense but Eisele shut the door on both occasions. It wasn’t a great night for either goaltender as both Eisele and Amundrud struggled (although I liked Nik’s game through the first 40 minutes) in a high scoring affair between two teams that can score a few goals. A very exciting game to watch as a fan, a game to rip your hair out for coaches and one for the Warriors where they collect a point and will hope for a Salmon Arm victory on Thursday night when they head to Merritt to face-off against the Centennials before the Warriors and Cents meet in Merritt on Friday for a game of significant meaning. The Warriors head out on the road for their final two games of the regular season as they begin their final weekend with a trip to the Nicola Valley to face-off against the Merritt Centennials for a 7:00 PM puck drop. The game can be heard on the Warriors Internet Network and also streamed live on HockeyTV.com beginning at 6:45 PM with the pre-game show.